Richard's book: Becoming an Orchestral Musician – A Guide for Aspiring Professionals, sells world-wide and has been described as ‘an unbeatable-value master class’ (Classical Music Magazine) containing 'brilliance and honesty on every page' (Pan Magazine) offering a ‘down-to-earth, informative introduction to life as a professional musician’ (Daily Telegraph). ​Becoming an Orchestral Musician takes you on a journey into the musical profession. 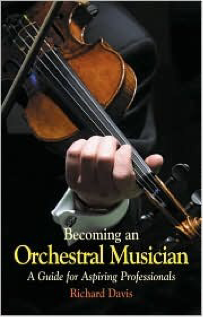 It is the first comprehensive guide for professional musicians on how to succeed in joining an orchestra or ensemble, and how to survive as an orchestral musician. Such crucial topics as how to obtain the right tuition, music college versus university, auditioning, nerves, the secrets of ensemble playing and intonation, conductors, the mechanics of the orchestra, performing philosophies and strategies for survival are covered in separate sections. The matter of how to explore and adapt one's musical psyche, the pitfalls of a career in music and the highs and lows of performing are also discussed. The history, mythology and science of music-making and numerous anecdotes provide a vivid background. It is essential reading for all orchestral musicians, including players of every instrument, whether at college or university or during their career, whether full-time or part-time, and whether professional or amateur, and also for the parents of budding instrumentalists. There are probably more orchestras and ensembles in the length and the breadth of Britain today than ever before. With the renewed recognition in schools of the importance of music, the competition among younger musicians has become intense. Schools and colleges need to be well informed about career guidance for their students. Richard Davis's book will give the answers to many of the questions those students will be asking.